lovely lewisham | tasty treats! I know what you’re thinking – Lewisham, lovely? An oxymoron, much? I myself have never been too enamoured with this part of south-east London, visiting sporadically during my uni days only for the daily street market (cheap fruit and veg), Primark (shamefully) and the occasional treat from Marks & Spencer’s (mmm, it’s not just steak…). Now that I live a lot closer, I figured I should give this battered old place another chance. 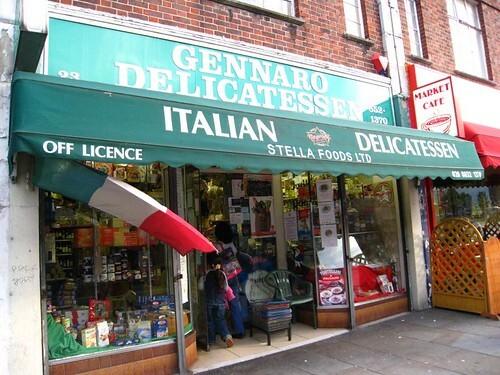 Spinning off the well-trodden paths of Lewisham High Street, I wandered onto Lewis Grove and stumbled across this lovely Italian delicatessen. It’s been operating for over 25 years, and has been passed down from generation to generation, so I had a bit of a forehead-slapping moment when I realised this gem of a place had gone unnoticed by me for the past 4 years! Serendipity is a wonderful thing, isn’t it? 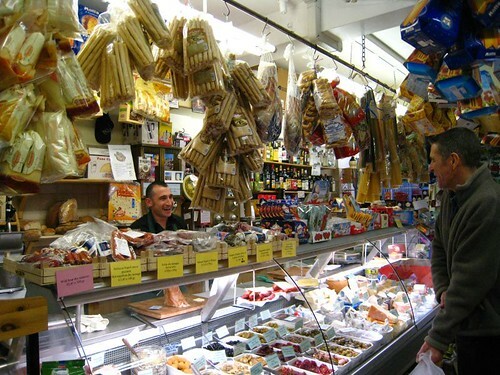 Stepping in through the doors is an experience that is as clichéd as they come, because walking into Gennaro was like being transported to the quaint and messily-organised delicatessens I’ve visited in Italy. 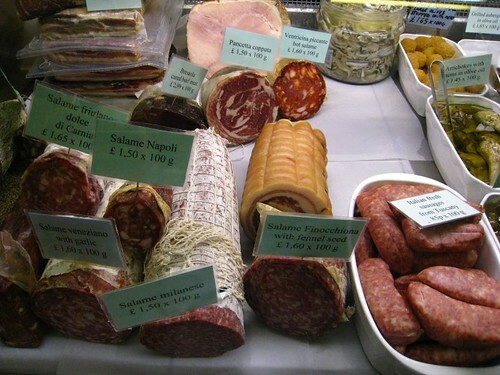 Charcuterie, cheeses and other nibbles are proudly on display at the counter at one end of the shop, behind which Antonio and his sister Alba stand beaming with welcomes. The rest of the shop holds everything that any dedicated Italian chef or roaming gourmand would ever want – countless varieties of pasta, biscuits and grains from different regions of Italy, jars filled with artichokes, anchovies, sundried tomatoes and more, an endless selection of passata and of course, a respectable display of olive oils. 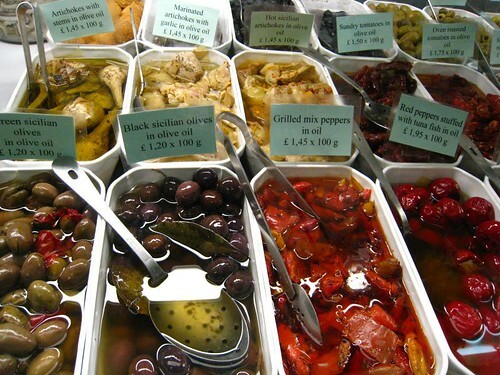 Displays worthy of any snooty department store food hall, but with more reasonable prices. A lovely place. During the time I was there several Italians had whizzed in and out with a flurry of buongiorno’s and ciao’s, stepping back out into grimy Lewisham armed with produce of the day. It was all a bit overwhelming, and since I’m going away for the weekend it meant that I shouldn’t really have indulged in anything anyway, but in the end I went back to my old favourite – prosciutto. Just one word: divine. Two pieces were quickly ravaged as soon as I got home – it was a right sight. 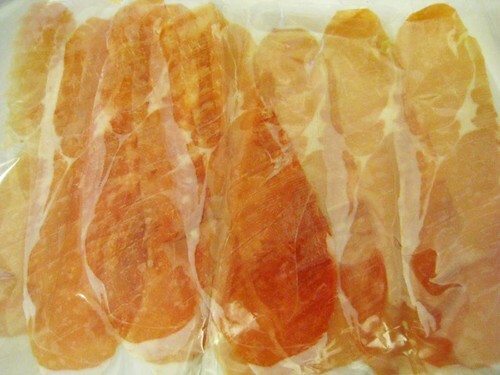 Lately I’ve been doing something a bit sacreligious with prosciutto – crisping it up under the grill and having it on thickly sliced white bread with scrambled eggs. Don’t gasp before you’ve tried it! I must have spent about five full minutes pacing back and forth in front of the shelf of olive oils. So many foreign brands, so little knowledge have I! So I asked Antonio, who happily told me about the different brands. 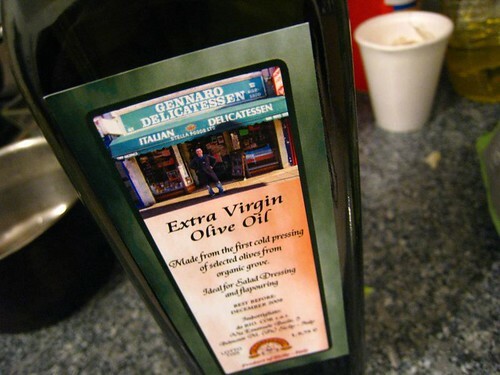 Ultimately, he plumped for this special new ‘Gennaro’ brand organic extra virgin olive oil, apparently a partnership between the deli and an artisanal producer back in Sicily, who are eager to introduce their wares in London. Always on the lookout for something a bit obscure and unique, I chose that one (don’t think Antonio only pushed that bottle – he recommended two other high-quality oils that weren’t coincidentally the most expensive ones). Not being in a olive oil mood tonight, I can’t give a full report on it yet! A bit of googling after I got home revealed that apparently they do great fresh bread and coffee as well, which I’ll definitely be going back to try. They had also run out of fresh mozzarella that day too (which they get from the province of Caserta in Campania, the region from where the cheese originated), but apparently Saturday is the day to go to get the best. You know where I’ll be next weekend. Apparently there’s a fantastic Turkish shop in Lewisham as well, which I shall soon seek out. Any other gems in the area that I should know about, dear readers? 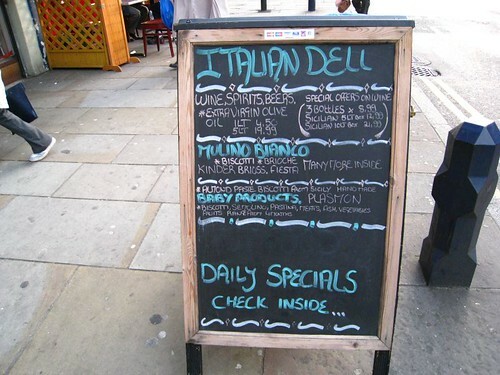 Entry filed under: deli, delicatessen, italian, lewisham, london, review, shop, south-east london. looks good, I should go sometime! Hi, nice review, I’m a long-standing customer of Gennaro and yes, it’s one of the top features of Lewisham. The fresh buffalo mozzarelle are great indeed. Looking fwd to your olive oil review; I’m looking for a really strong fruity flavoured one to take back to HKG. Would you recommend yours? And Zada, I’ve tried it now and it’s pretty darn good – very fruity, full of flavour. It’s also first press. This place really is fab – I can recommend the coffee and tbe bread too! Gennaro’s is wonderful. Antonio is lovely, and the food they source is fantastic. Great ice cream over the summer, and cherry tomatoes freshly imported from Sicily. A local treasure. There is indeed also a very good Turkish supermarket in Lewisham, in the area of the main library. Besides – some rather good Chinese supermarkets. Lee High Road, I think.